Click here for our featured listings! The progressive city of Buford GA lies less than 40 miles from Atlanta, but is a world away in culture and lifestyle. About 40 years younger than Atlanta, and a full 130 plus years younger than Savannah, Buford was named for a wealthy Virginia attorney and legislative member, Algernon Buford. The civil war was over in 1865, and Buford's township was declared in 1872. The burning and damage done to Atlanta and other southern cities after the war has never had a place in Buford's history. From the beginning, this city was centered around business and education. Long known for its high ranking Buford High School, students early on came from miles around and other counties to attend and acquire its more prestigious diploma. Their football team has one of the best records in the State. Buford had the first bank in the county, and with its more wealthy and industrious citizens, it's never attained the sleepy, southern reputation of most of Georgia. Present day Buford is upscale and Buford GA real estate is valued for its industry as well as its proximity to the much desired Lake Lanier resort area. Lake Lanier homes represent some of the most luxurious lifestyles in the south, but offer easy commuting to the well-paying jobs and enterprise of Buford and Atlanta. Likewise the cities of Lawrenceville GA and Braselton benefit from being close to both places. 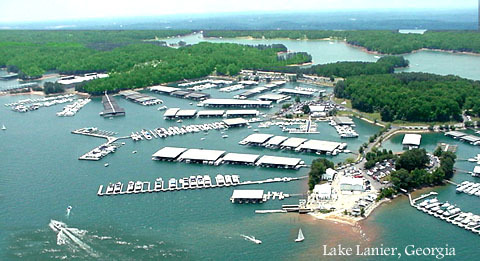 Buford also boasts its own marina on Lake Lanier, Holiday Marina. Lake Lanier comprises 60 square miles and over 600 miles of shoreline. Although built in the 50's for flood control, this beautiful lake has grown to attract an estimated 7.5 million vacationers every year, from fishermen to pleasure boaters. Since Buford has the Holiday Marina, and nearby Flowery Branch has Aqualand Marina, the lake's allure draws residents to both cities. Lake Lanier real estate is some of the most highly sought-after property in the state of Georgia. We have numerous Lake Lanier foreclosures, although they are not as deeply discounted in price as homes in Buford or Braselton. Lake Lanier lakefront lots are few and far between, most having been built upon, and you can expect to pay a premium price for the good ones that are left. We specialize in real estate in the cities of Buford, Lawrenceville, Suwanee, Braselton, and Flowery Branch. This group of Metro Atlanta towns offer a wonderful lifestyle, great schools, access to the fun of a lake resort, and represents the best of the south. We hope you'll use our website to learn about our area, search our MLS, and then let us help you find that perfect home in Buford, GA! Visit our Foreclosure List for your custom list. Please call us---Atlanta Home Connections---at 678 546-7387 or visit our Contact Us page to send us an email. We will get in touch right away to discuss your needs. There is never any obligation. Many of these neighborhoods are located in North Fulton, Hall, Gwinnett and Forsyth counties. Located in the foothills of the Appalachian Mountains, residents can enjoy the beautiful, scenic atmosphere in the midst of various urban amenities. Industry has grown rapidly in the area especially in the fields of science and computer technologies, which provide countless job opportunities.When you are ready to buy or sell a home in Buford GA, a home or condo on Lake Lanier, or other property - Atlanta Home Connections will be happy to assist you. As an internationally recognized city and home of Georgia's state capital, the north metro Atlanta area offers everything its residents could ever want or need - a strong economy, excellent medical facilities, good schools, a competitive cost of living, plenty of shopping and dining options as well as diverse entertainment and recreation opportunities. Although the city is one of the largest in the South, many neighborhoods provide a sense of community that is typically found in small towns. North metro cities such as Buford, Braselton, and Flowery Branch offer their residents affordable living for many different lifestyles.